Reality Redone: Summer House Recap, Season 3, Episode 3 - "Firework Starter"
DANIELLE - Well, I've got to go catch a train. Big presentation in Milwaukee this week. HANNAH - I thought it was Chicago. LINDSAY - So, Jordan, how was hooking up with Danielle? JORDAN - It was just a make-out. I've gone further with my cousin Chad. LINDSAY - But who do you like more? Paige or Danielle? And, yes, I am well into my 30s, why do you ask. JORDAN - To put it kindly, Paige is the one you take to internet church while you facetime with your grandma. JORDAN - And Danielle is the one you throw into a trash heap on Sunday, two days before it's picked up by Streets and San. KYLE - He's got a way with words, this one. KYLE - I'm feeling good about this venture. It's another Four Loko in the making. BEVERAGE MANUFACTURER - **to Amanda** And you're his partner? AMANDA - I'm just here to support him by criticizing his drinking habits. KYLE - That's all she ever does. Literally. AMANDA - One time I chopped vegetables passive-aggressively. KYLE - You see, I cheated on her. AMANDA - He cheated on me. But he was blacked out. KYLE - And I regret it. I'm never gonna find taters like this on another girl. 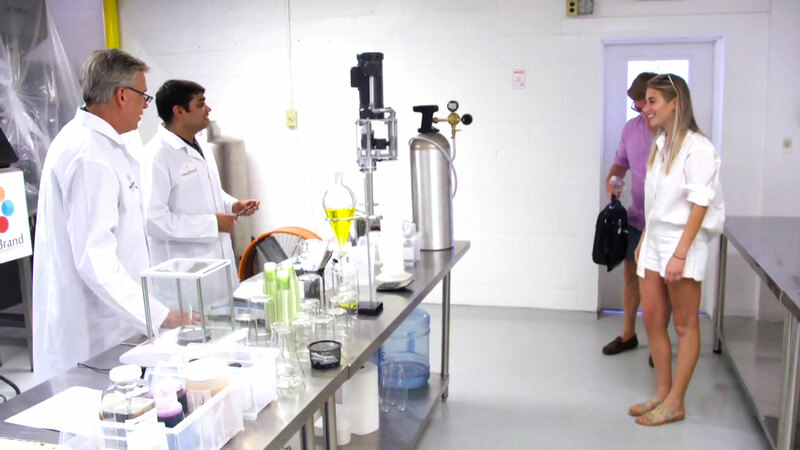 KYLE - This guy's got a lot to learn about products developed solely for the sake of a reality show storyline. KYLE - Bro time, Bro! JORDAN - It's already been sended! CARL - Millennial term I might be too old to use! KYLE - But seriously. Jordan, tell us about the inner workings of your heart. Have you found love this summer? JORDAN - You may have heard my trash heap metaphor earlier. It still stands. DANIELLE - **pops out of nowhere** Hey, guys! DANIELLE - Don't worry, I didn't hear. Oxy. JORDAN - I know which pharmaceutical company I'm giving thanks to during my next internet church session. LINDSAY - Hey, just to follow up on the mountain of humiliation we've piled upon you, Jordan isn't in to you. HANNAH - He said it to all of us. And now we are saying it to you. DANIELLE - If I was capable of thinking about anything beyond "the D", I'd be extremely upset with the immature way this has been communicated. PAIGE - Man oh man, do you miss out by not doing coke. HANNAH - It's ok. I was ranked 15th in the country in tennis in high school. PAIGE - This has nothing to do with tennis. At all. HANNAH - Everything has to do with tennis. EVERETT - **sneaking into Lindsey's room** Lindsey, it's time to make some Love.